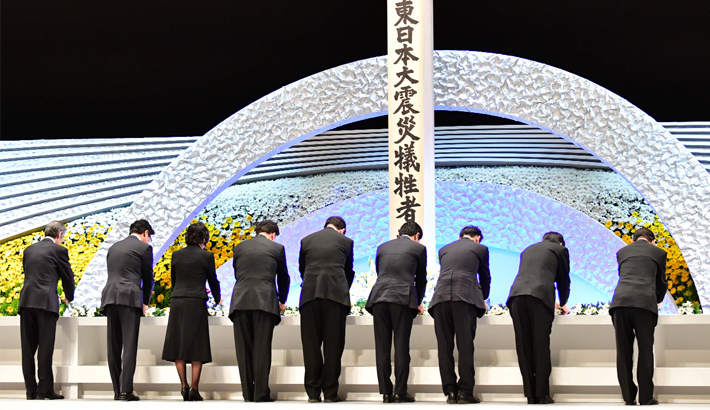 TOKYO: With flowers, silent prayers and tearful tributes, Japan Monday marked the eighth anniversary of a crippling earthquake, tsunami and nuclear disaster that devastated its northeastern coast and left some 18,500 people dead or missing, reports AFP. Prime Minister Shinzo Abe, lawmakers and family members who lost their loved ones in the disaster bowed their heads in prayer at a ceremony in Tokyo at 2:46 pm (0546 GMT) — the exact moment the magnitude-9.0 quake struck. “We can’t help but feel sorrow when we think about the suffering of those who lost beloved family members, relatives and friends,” Abe said. Eight years on, he said reconstruction was making “steady” progress but vowed to continue government support to tens of thousands still struggling in uncomfortable living conditions. In a constant drizzle, residents in tsunami-hit coastal towns also laid bouquets and bowed their heads as they remembered the moment the waves hit, devastating entire communities in an instant. Japan’s ageing Emperor Akihito and Empress Michiko did not attend the ceremony this year, but were represented by their second son Prince Akishino and his wife Princess Kiko. In addition to causing widespread death and destruction, the killer tsunami also swamped the emergency power supply at the Fukushima Daiichi power plant. This sent its reactors into meltdown as cooling systems failed, sparking the worst global nuclear disaster since Chernobyl in 1986. According to the National Police Agency, some 18,430 people died or were missing as a result of the earthquake and tsunami. In addition, more than 3,700 people—most of them from Fukushima—died from illness or suicide linked to the aftermath of the tragedy, according to government data, while more than 51,000 still remain displaced. Although no-one is officially recorded as having died as a result of radiation from the accident, dozens of reactors across Japan were switched off in the aftermath.